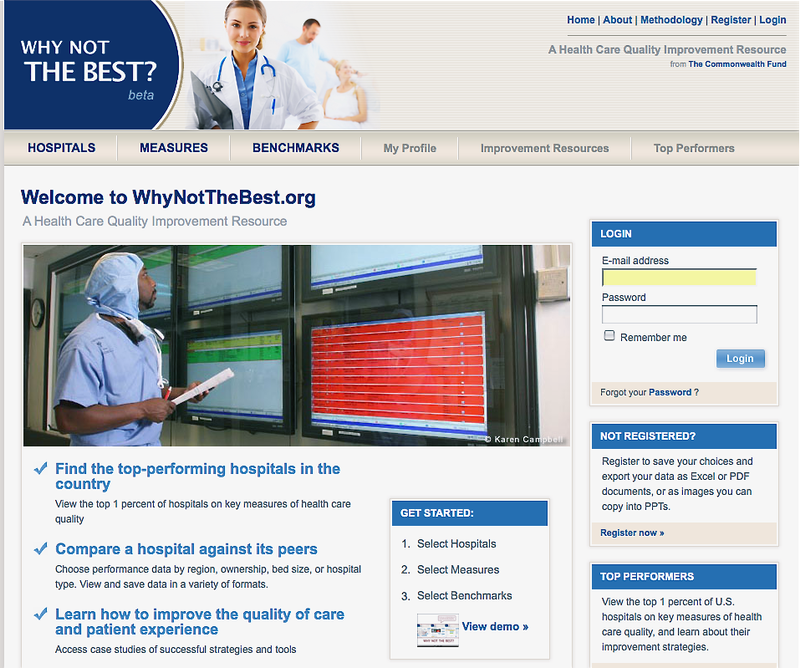 When It Comes to Health Care, Commonwealth Fund Website Asks: Why Not the Best? Web sites that provide easily accessible information about the best restaurants, stores or travel destinations also serve as an incentive to keep quality high in order to avoid bad ratings. Could such a Web site similarly help improve the quality of health care at U.S. hospitals? That’s one of the questions the Commonwealth Fund hopes to answer from Why Not The Best? 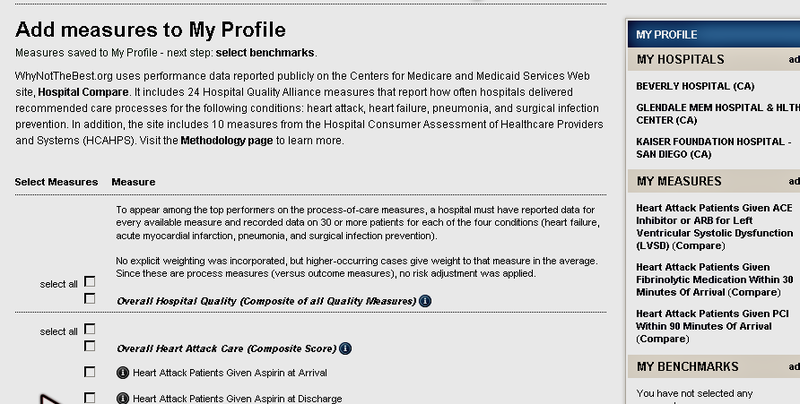 – a free online resource that tracks performance on various measures of health care quality at U.S. hospitals. The site enables hospitals to compare their performance against that of their peers as well as against a range of benchmarks and over time. Case studies and improvement tools spotlight successful improvement strategies of the nation’s top performers. The Web site, which launched in late 2008, grew out of the second of two national “scorecards” the Fund commissioned that graded health care in the United States on outcomes, quality, access, efficiency, and equity. The 2008 Scorecard, which updated findings from the first such report two years earlier, found that that the U.S. health system continues to fall far short of what is attainable, especially given the resources invested. Rather than limit its work to calling attention to the deficiencies in health care and expecting others to respond, the foundation decided to go the extra step and provide a tool that would both shine a constant spotlight on quality of care, while also serving as an impetus to make improvements. Before launching Why Not the Best, the Commonwealth Fund examined what kind of information about the quality of health care was already available online, and how it was meant to improve service delivery, said Barry Scholl, vice president of communications. According to Scholl, most of the Web sites that publish quality measures — such as the percentage of time hospitals provide specific types of care for heart attack patients – primarily serve the needs of researchers. None catered to the needs of medical directors or others interested in helping their hospitals’ performance. As a result, Commonwealth found a unique niche to fill: make a site for hospital medical directors and other providers where the quality measures would be easier to access and would provide relevant case studies and improvement tools alongside the data, so that hospitals could take steps to improve their own care. One of the first things Commonwealth did was assemble a project team that included both program and communications staff. Anne-Marie J. Audet, M.D., vice president of quality improvement and efficiency, represented program staff and Martha Hostetter, a consultant to Commonwealth, provided communications oversight and guidance. The Commonwealth team also worked with a quality improvement organization, IPRO, and a design firm to develop the site. Scholl describes the collaboration among the team members as “intense.” Audet and Hostetter talked to each other and IPRO almost daily through the life of the project. Each of the members relied on the other for their specific knowledge and expertise. For instance, Audet provided guidance on the audiences Commonwealth needed to reach with the new Web site as well as what data and tools would help them the most. Meanwhile, IPRO developed prototypes of the site, which were tested among potential audiences. Marketing and promotion for the site began before launch. Sharing the prototypes early in the process contributed to interest in the project, Scholl said. Closer to the launch date, the Fund contacted people in key groups about the site, and scheduled walkthroughs for those interested in learning more. The site itself was officially unveiled at a breakfast briefing at an Institute for Healthcare Improvement in December 2008. Currently the site – which is still in beta – offers 23 Hospital Quality Alliance measures that report how often hospitals delivered the recommended care for heart attacks, heart failure, pneumonia and surgical care. In addition, the site includes 10 measures of patient satisfaction data from the Hospital Consumer Assessment of Healthcare Providers and Systems (HCAHPS). Visitors can compare how one or more hospitals compare with national benchmarks — the top 10 percent of hospitals, the top one percent of hospitals as well as state and national averages. Alongside the data, the site offers case studies of high-performing hospitals as well as more than 40 quality improvement tools, mostly developed by the Joint Commission and the Institute for Healthcare Improvement. In 2009, the Fund plans to add additional data and validated quality improvement tools and case studies, Hostetter said. So far, more 3,000 people have registered at the site, and visitors view an average of eight or nine pages, which reflects a high degree of interest. Hostetter said the Fund continues to welcome feedback from users so the site can continue to improve as it evolves to include more data.